Turn your logs into valuable lumber for framing, fencing, siding, landscape timbers, turning blocks, cross ties, or whatever you want with my portable sawmill service. I can saw logs up to 36 inches in diameter and 20.5 feet long with my Wood-Mizer LT40 Hydraulic bandsawmill, pictured at right. I operate the mill and also have a helper. Most people that I saw for help or provide one or two helpers for offbearing and stacking lumber and slabs. That increases productivity greatly. 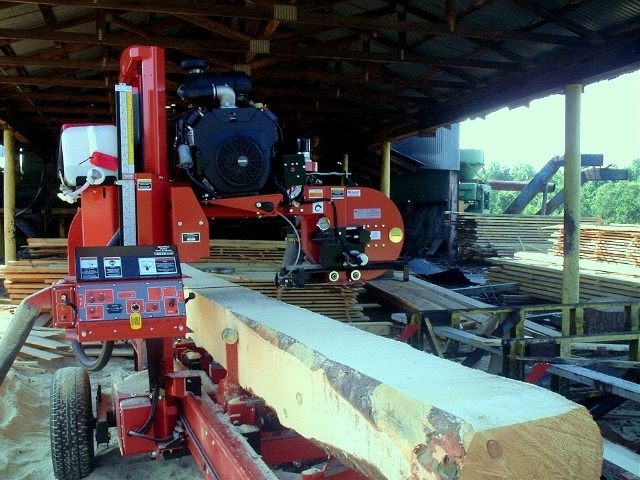 Friddle's Custom Sawing provides custom sawing with a Wood-Mizer portable sawmill. 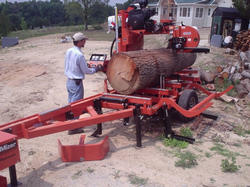 The bandsaw type sawmill means that you get more lumber and less sawdust than with a traditional circle sawmill. Besides, the mill comes to you instead of you having to haul your logs to the mill, then go back and pick up your lumber when it is sawn. I service Rockingham County, Greensboro, NC, and the areas generally located within about 30 miles from Stokesdale, NC. Such as Reidsville, Eden, Madison, Mayodan, High Point, Colfax, Gibsonville, Kernersville, and those cities east of Greensboro that have a Greensboro address. For greater distances we can likely work something out for your needs when you pay for travel time. For sawing close to home, there is no travel or setup charge, just a minimum charge. $85 per hour (includes one helper that comes with me) or 35 cents a board foot for most types of wood. $25 each for blades damaged by foreign objects in the wood. $25 for each time the mill needs to be moved if all your logs are not in the same pile. $200 minimum sawing charge for moving the mill to your location. $20 minimum sawing charge for sawing at my location and $70 per hour if you bring your logs to my location in Stokesdale. I use the hour meter on the mill for billing purposes, so you are only charged for the time the mill is running once the minimum is met, unless additional work is required with moving logs or significant time spent on other activities when the mill is not running. I will be happy to come by and have a look at your logs and give you an estimate. FYI: Rough cut lumber generally sells for around 65 cents to $4 a board foot, so this is a pretty good deal for anyone who has their own logs to turn into lumber for building projects, etc.